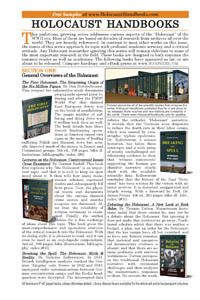 You can help us spead the good news that this fantastic series Holocaust Handbooks exists – or you can spread the good news of Holocaust revisionism in general – or both. Note that none of the items listed below is copyright-protected. This means you can download them and spread them through all electronic channels at your disposal, or you can print as many copies of them on your home printer as you like, or give them to a copy shop or professional printer to make as many copies as you need for whatever purpose you like: to give away as information free of charge, or to sell them for as much as you can get for them. If you would like us to make printing arrangments for you instead and ship the item wherever you want them shipped, please get in touch so we can make the pertinent arrangements. 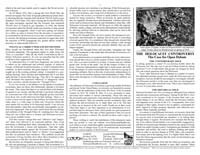 This double-sided letter-size leaflet (to be folded as instructed at the bottom of the leaflet) gives the novice a brief introduction into what Holocaust Revisionism is. These are suitable for leaving under windshield wipers. Remember, this flyer is not copyright-protected. Click on the illustration or right here to download it. You can also order printed hard copies of this item from the publisher here. 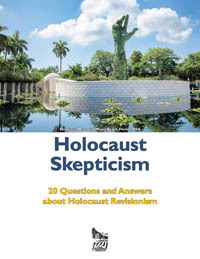 This 15-page brochure introduces the novice to the concept of Holocaust revisionism, and answers 20 tough questions, among them: What does Holocaust revisionism claim? Why should I take Holocaust revisionism more seriously than the claim that the earth is flat? How about the testimonies by survivors and confessions by perpetrators? Remember, this pamphlet is not copyright-protected. Click on the illustration or right here to download it. 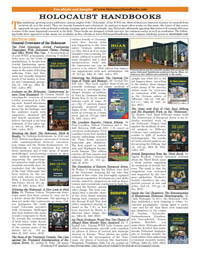 This double-sided letter-size leaflet has a short description of all the books which currently form the series Holocaust Handbooks, plus a few currently in preparation. Remember, this flyer is not copyright-protected. Click on the illustration or right here to download it. This 8-page brochure (6"×9") has a description plus cover illustration of all the books which currently form the series Holocaust Handbooks, plus a few currently in preparation. Remember, this pamphlet is not copyright-protected. Click on the illustration or right here to download it. This 37-second video clip promoting the Holocaust Handbooks is appended to all our video documentaries. If you want to help us with this by appending it to the end of your videos, please feel free to download it right here (right-click on the link, then select option "Save links as…"). You can then spread it through all video and electronic channels at your disposal.